When we wrote a highly read review on the Mako Torq and its spinning handle a few months back we asked, “what will the baseball bat industry think of next?” Well, we finally have our answer: It’s the RIP-IT Helium BBCOR bat that will be available for the 2015 season. At first glance we thought the idea of naming bats after stable gasses was a great idea. Light swings are en vogue these days and what better way to brand that idea than a bat named after a gas. 2015 could be Helium. 2016 they could go with Neon. 2017 could be Argon and then you’d be left w… Jump to the full review. We aren’t the only ones to have information about the Helium. Other places, in particular those who sell bats, usually have a boiler plate write up on the specs of a bat. Many of those we reference to make sure we are seeing what we should be. 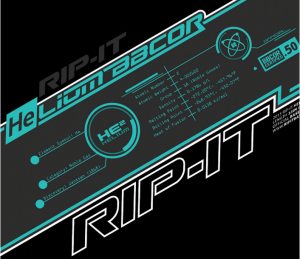 Here are some more references for the 2015 RIP-IT Helium review. At first glance we thought the idea of naming bats after stable gasses was a great idea. Light swings are en vogue these days and what better way to brand that idea than a bat named after a gas. 2015 could be Helium. 2016 they could go with Neon. 2017 could be Argon and then you’d be left with Chlorine in 2018–which no one would buy on that name. Surely 2019 would be Krypton to revitalize the bat line and who wouldn’t want a bat named Krypton? The gas-naming theme seemed perfectly sane. And by a bit more, I mean a lot more. The bat isn’t just named after a gas, the bat is actually pressured with the gas inside. Yes, the 2015 RIP-IT Helium bat is air sealed through a 47 step process and then, like a basketball, pumped full of helium gas. The pressure is actually so much they need to get special clearance from the government to ship the bat around the country. Not kidding. Sounds awesome. But why? No, really, why? The answer was apparent once we got some exclusive cuts with the bat. Before I share, let me first point out what this helium filled bat isn’t. A bat pressurized with helium isn’t like playing baseball on the moon. The bat, much to our disappointment, does not float in the air. Nor does it somehow defy the laws of physics and hit baseballs as if you were in a stadium also pressurized with helium. Further, the bat is still .50 BBCOR certified and its pop isn’t allowed to be any greater than other high end performance bats on the market. But what this helium pressurized cabin allows is more mass in the barrel to support the integrity of the sweet spot and barrel length without adding to the swing weight–because that added barrel weight to support its structure and function is negated by a lighter than air material pushing the bat away from the earth. Few bats have more traction in the high performance bat space than the 5150. That’s because it has a lot of things going for it. First, it has a great pedigree. Second, it has a nice price point for a high end bat. And third, its reviews, year after year, have always been stellar. If you are looking for the light swinging BBCOR in the one piece aluminum marketyou’ve come to the right place. Like other 2015 RIP-IT performance baseball bats (Air Elite and Air), the 2015 RIP-IT Helium bat feels smooth and is unpretentious: it is a bat made to hit baseballs—not make you dinner. The Helium has a hand loaded swing weight like DeMarini’s CF7 or the Rawlings’ Velo and has a noticeably lighter swing weight than the Air or Air Elite also from RIP-IT. It comes with a 400 day warranty. The RIP-IT Helium is a 5 piece bat made of an aluminum alloy and perfectly sealed and tested to contain pressurized helium gas. Though we can’t yet play baseball on the moon, the 2015 RIP-IT Helium may let us hit one to it. We would recommend this bat for hitters who: Prefer lighter swing weights; Are looking for a performance top shelf bat that may very well be the best bat of 2015. We would not recommend this bat for hitters who: Prefer an end loaded bat; are on a budget. RIP-IT is only making 5,000 of these bats. Best place to buy should be here.